So you know when you have a recipe that you love and you just want to keep making it? Well, in normal life that’s fine, but when you write a food blog change is good. That means rarely do I get to eat the same twice. But it doesn’t mean that I can’t change things up and remake a recipe so I get to eat that same recipe, but in a different way. Stir fry is the recipe I would eat all the time. So here is another remake to Pad Thai. 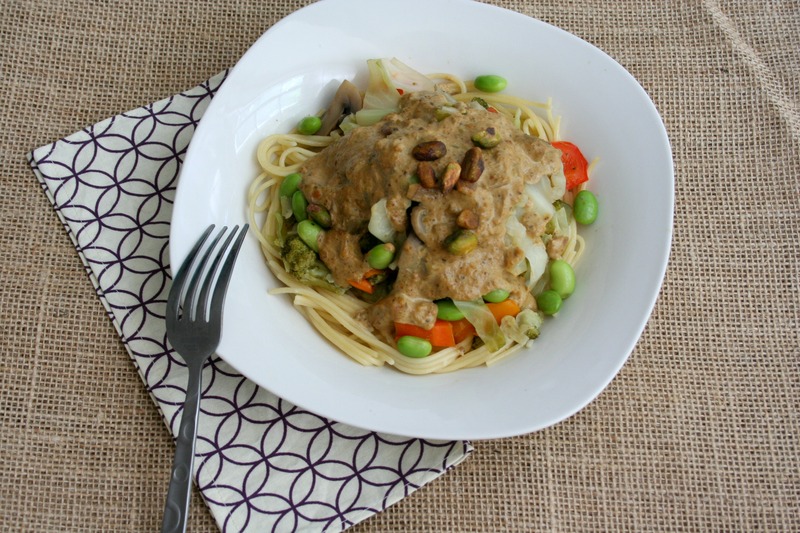 Here is my vegan and gluten-free Pistachio Butter Pad Thai. 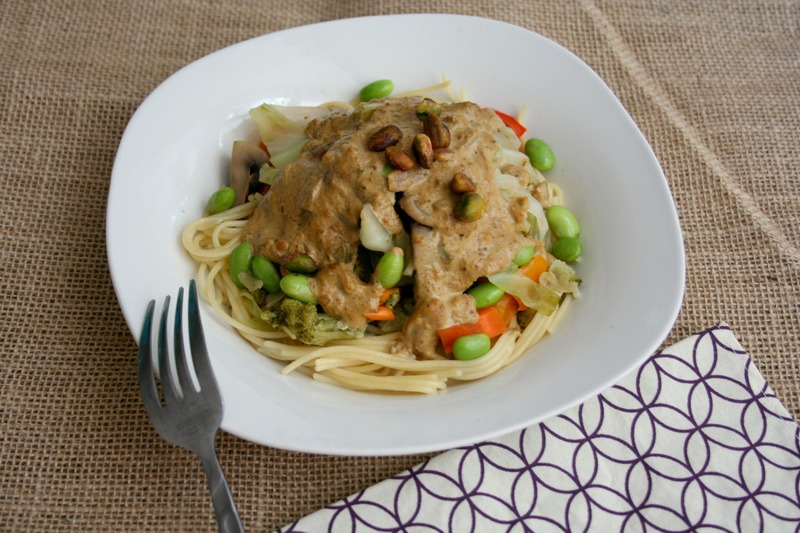 I don’t know about you, but softened soy- or tamari- drenched veggies is one of my most favorite meals. Before food blogging I would just make the same meals over and over and, yes, stir fry was that meal. Well, in comes Pad Thai – a new favorite twisted from the old. How do you continue to remake Pad Thai? 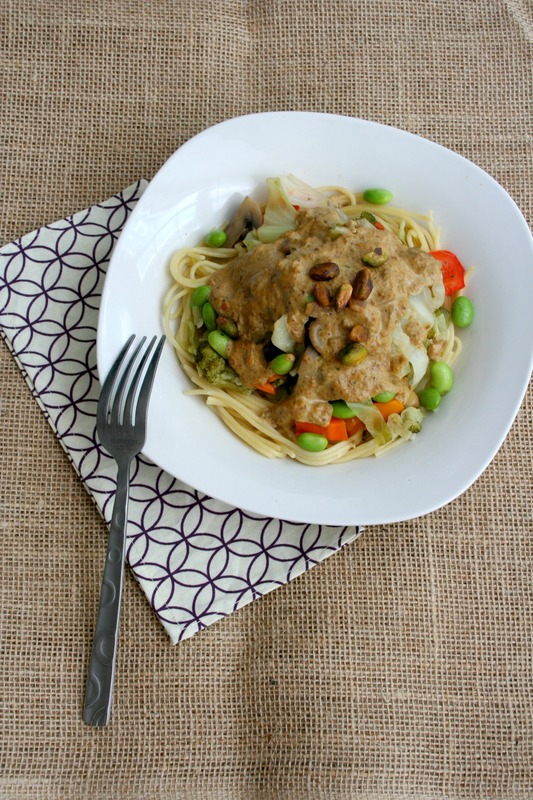 By using different nut butters, that’s how! I guess my eyes were bigger than I thought – or I should really just not grocery shop when starving, but I bought a ton of veggies for this. I didn’t find any raw pistachios at the store, but I had a coupon for Wonderful Pistachios and bought the only shelled kind (because I was so not going to crack all those pistachios for this recipe!) the store had, the roasted and salted. So no need at all for salt anywhere else in this recipe. I bought so much veg that I had to use two pots – and I mainly did this so that it wouldn’t take so long to cook. It’s getting warm outside and I don’t want to spend forever in front of hot burners, even for my love of stir fry. The other two burners were put into use for the pistachio butter sauce and the gluten-free spaghetti noodles – gotta have some carb. Start by processing the nuts in a small food processor about one minute. When the nuts are powdered dump in a quarter cup water to turn it into butter – process until a round ball forms. 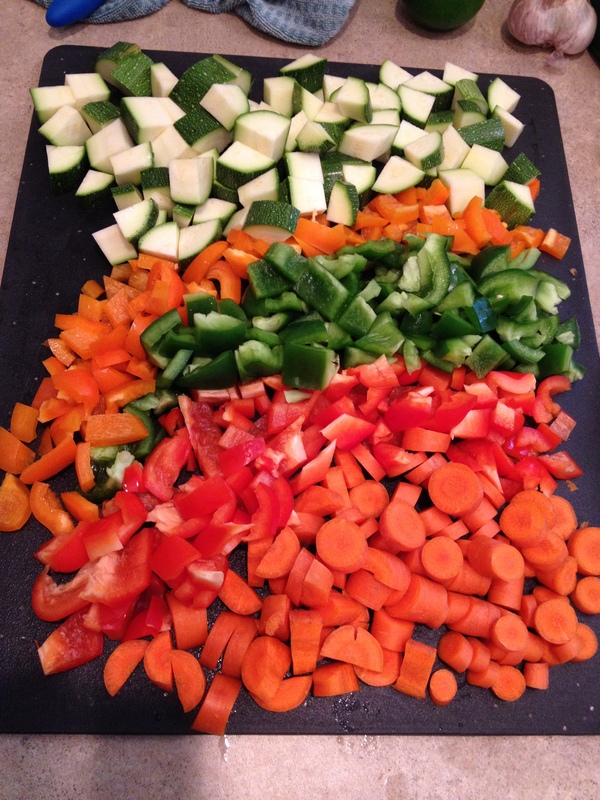 Set aside then start chopping veggies for the pots. To use no oil in the two pots of veggies I poured about one cup veg broth into my biggest pot and added the chopped carrots, peppers, and zucchini, then defrosted the broccoli and added that to the pot too. 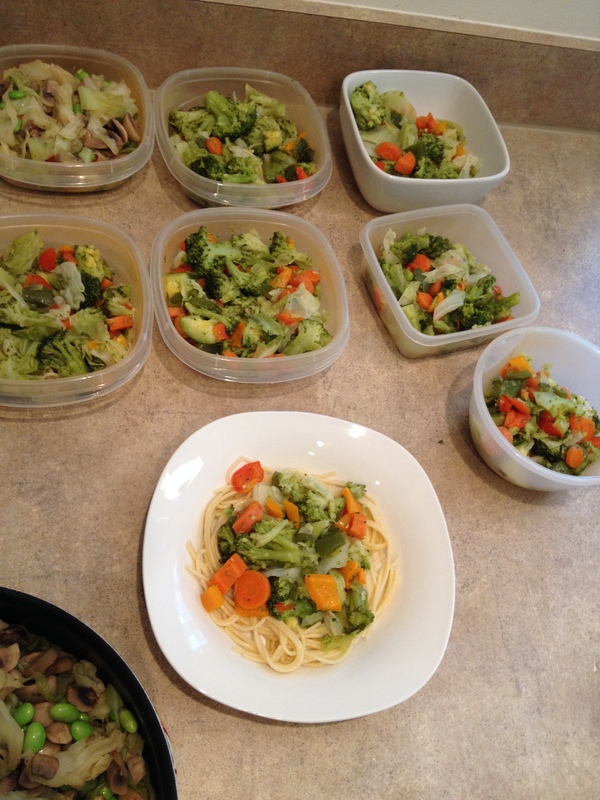 Let veggies softened until liquid is gone – it will take a while because of so many veggies, but it’s worth it. In the other pot don’t pour any liquid, just add the quartered mushrooms and the quartered and sliced cabbage – the mushrooms liquid is more than enough to soften the cabbage. 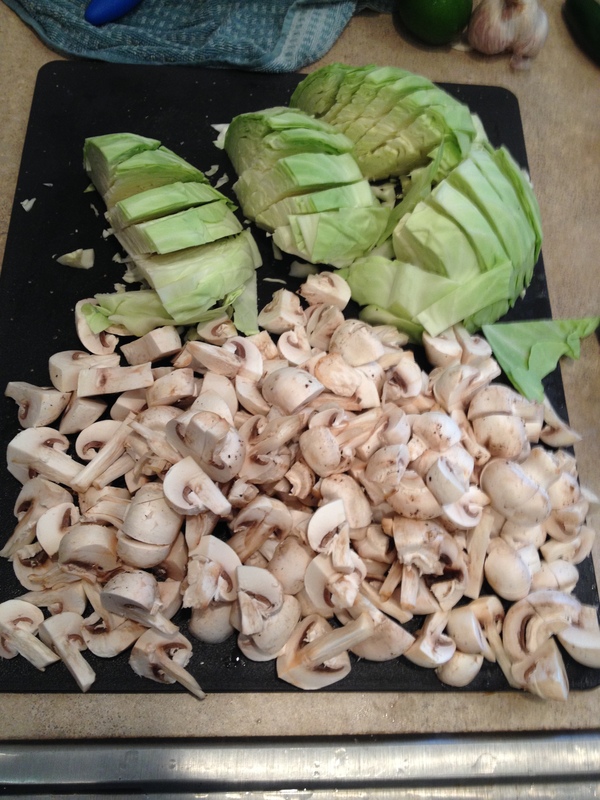 Defrost the edamame and add to mushroom and cabbage pot. Let cook until all liquid is gone. 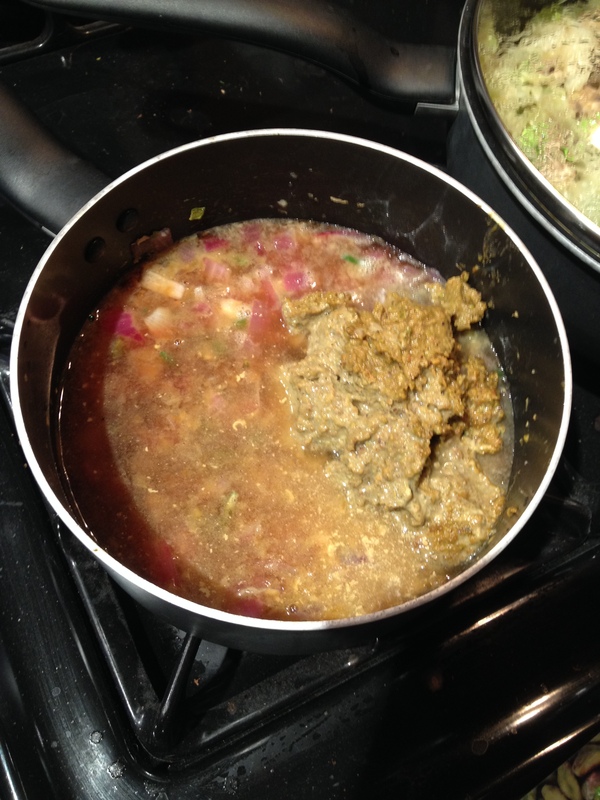 Once you have all veggies working chop onion and mince the entire bulb of garlic and the jalapeno – it may seem like a lot of garlic and it may seem like not seeding and taking out the ribs of the jalapeno will make the sauce too spicy but with so many veggies it will be tame, trust me. And you can never have too much garlic or a little spice. 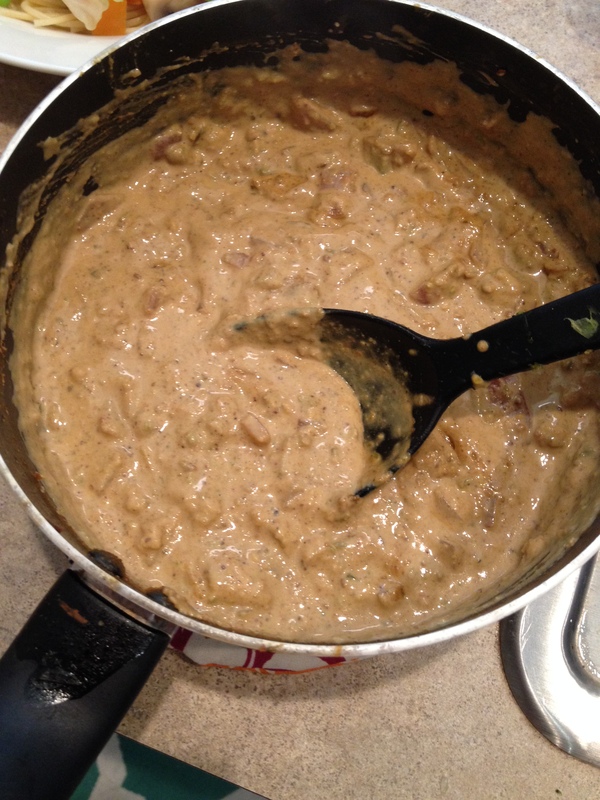 In a small pot add one tablespoon olive oil and the onions, garlic, and jalapeno and let soften. Add in rest of sauce ingredients and put on low heat to simmer. Start the pot of water for the noodles. I only used half the box of spaghetti and I broke the noodles in half before dumping in the boiling water. Boil until just tender then drain. Portion out everything and enjoy! 1. 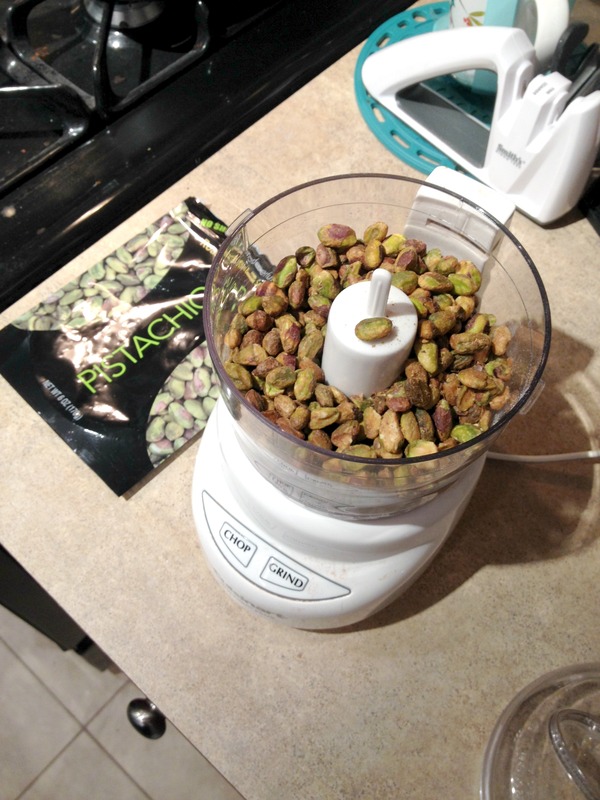 Dump pistachios in small food processor and grind until powdered. Pour in 1/4 cup water and process until ball forms. 2. 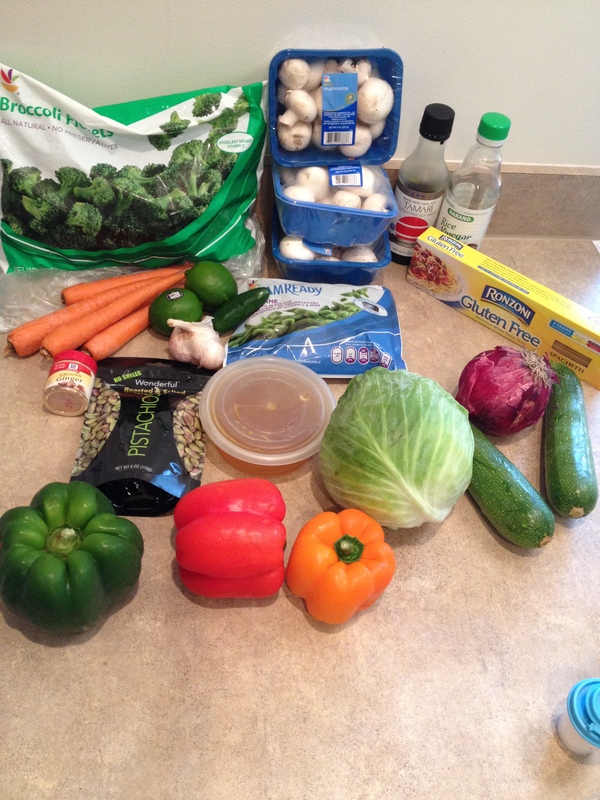 Chop peppers, carrots, and zucchini into small pieces and dump into a large pot with 1 cup veg broth. Turn burner to medium and sweat veggies out. 3. 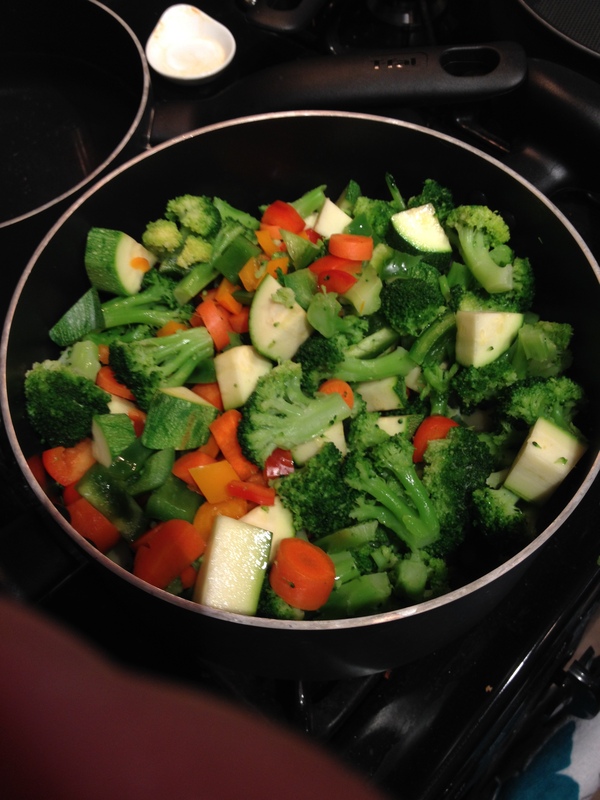 Defrost broccoli in microwave 4 minutes then add to peppers pot. Defrost edamame two minutes. 4. Quarter mushrooms and quarter cabbage then slice thinly. 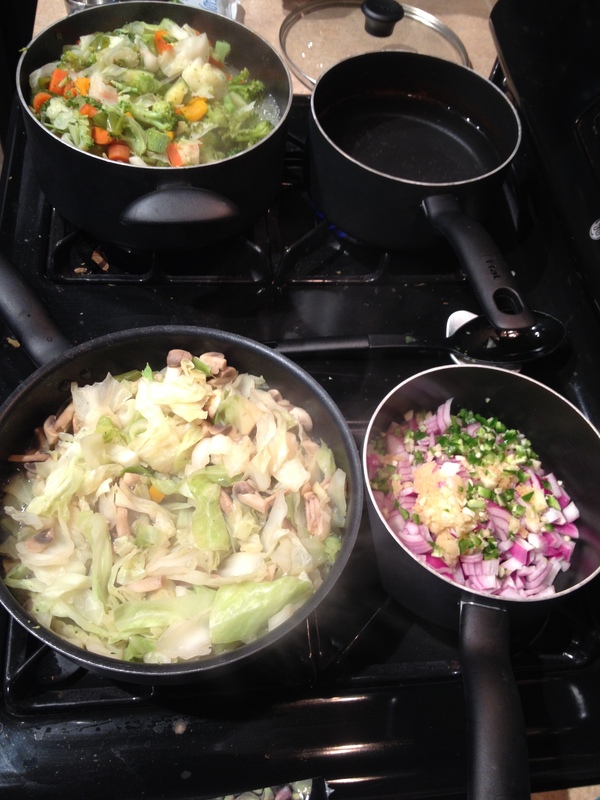 Add mushrooms and cabbage to another pot and set burner to medium. Let mushrooms sweat their liquid out and soften cabbage. 5. Chop onion small and mince garlic and jalapeno then add to a small pot with oil. Saute until just softened then add rest of sauce ingredients. Let simmer on low heat while everything else finishes cooking. 6. 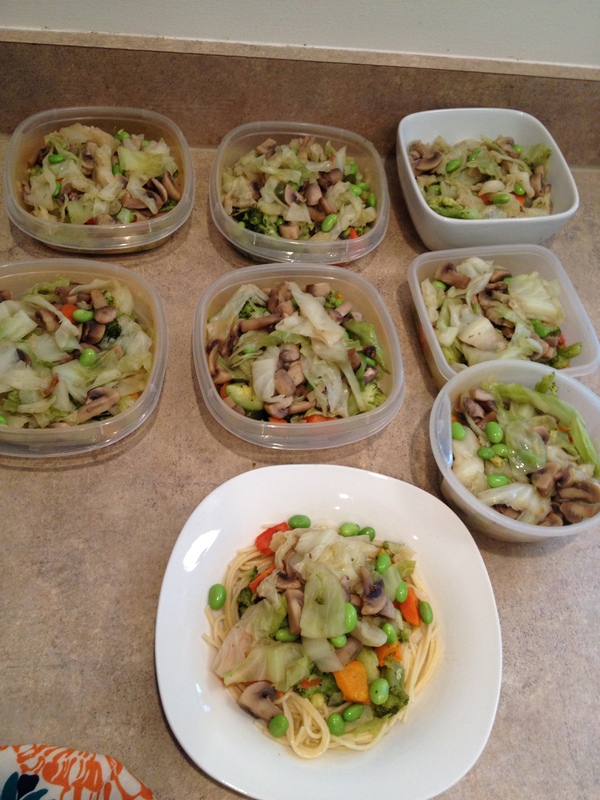 Add defrosted edamame to mushrooms and cabbage pot. 7. 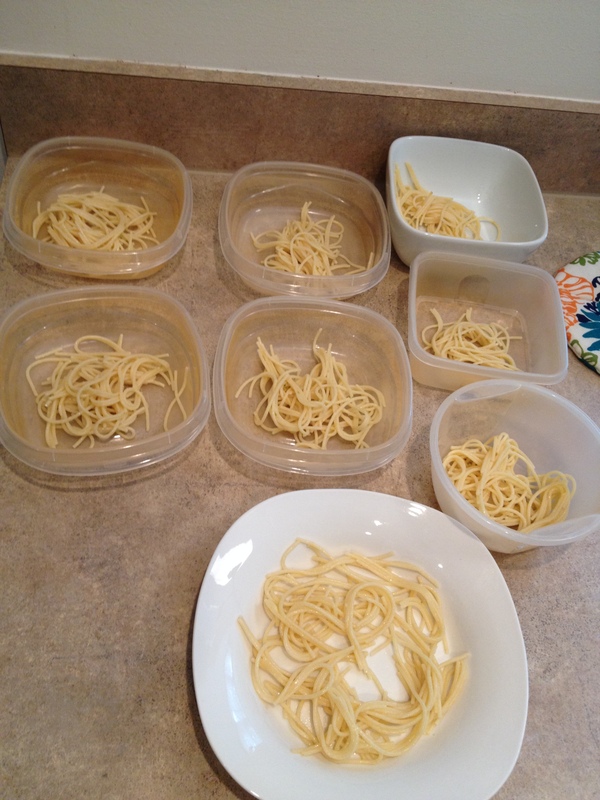 In another smaller pot add half the box of spaghetti, breaking in half as you add to the boiling water. Let boil until just tender then drain. 8. Portion out noodles then veggies, then pour a little sauce over the top of each. 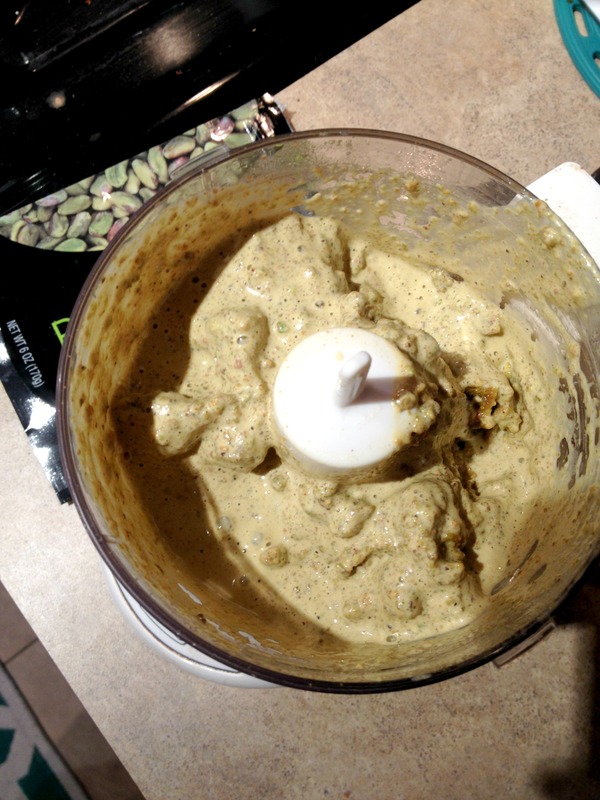 Oh my goodness … I would never have thought to use pistachio butter in pad thai … color me intrigued! I love that you used pistachios and not peanuts! So fabulous! Pistachios are so so so good!